If we can, we need to help the police focus their investigation as narrowly as possible. He has asked that ANYONE with ANY information about these events please contact the police. He recognizes that some individuals with pertinent information may not be comfortable with talking directly to the police but he wants all voices heard to help solve this crime. If you have descriptions of individuals, vehicle information, witnessed events in the park, or saw or heard anything else that might be relevant, PLEASE CONTACT THE POLICE. Thank you for your help in keeping our neighborhood safe. When we talk about gentrification, do we notice amenities like the basketball courts next to the petahnque whatevers as attempts to make an inclusive future? We should. And when the basketball courts’ broken backboards are replaced more than once, and then there’s a shooting, do we re-evaluate our position on whether or not we need to do something, up to making a phone call to discourage that armed and gangster cousin from passing time on or by the basketball court? Or, when a proposal for a soccer field or a rose garden that includes the removal of the basketball courts gets overwhelming anti-crime support from what has become the neighborhood, will we act like we didn’t, and we couldn’t have seen that coming? Remember, it would only take the city NOT spending money for the basketball court and those who use it to pass gently from the park leaving only echoes. Are you saying the basketball courts should be removed because they do not attract the “right” kind of people? Seriously? Deplorable. Nadine, I’m so glad you asked. 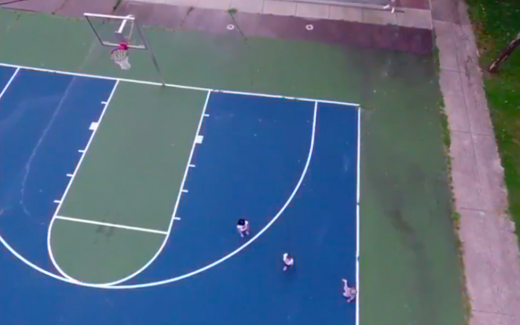 Shincidents like this shooting and the very visible and expensive vandalism that preceded it at the same location is exactly the sort of stuff that gets basketballs courts removed from parks, and from the plans for new parks. Especially urban parks in mixed income neighborhoods. I’ve sat through those meetings…. a torture I’m glad to have moved on from. That being a reality, and shooting people, especially in public with as high risk of bystander casualties being somewhere between bad and straight evil in my book, what I am in fact suggesting, is that people who use that basketball court there should get it together and stop it from getting a deserved reputation for being a locus for crime. I am further suggesting that no one, especially those of us who use the courts, should be surprised to see the basketball court removed in the next round of park renovations should this continue. So assuming you care, and you play and want to keep playing, yeah, I’m suggesting that if you know someone is armed and there with bad intent, have the decency and the strength to see to it that they leave before it goes sideways. Snitch hard if nothing else works. That’s why we’ve got police, like it or not. And then we can get back to the game. Which is more important than the crime bullsh$&.